The Architectural Inspirations Behind "Batman v. Superman"
Zack Snyder’s new big budget superhero epic Batman v. Superman has been largely panned by critics, holding a 29% “Rotten” rating on RottenTomatoes.com. However, the film has been enormously popular with the film-going public; at the time of writing, it has grossed nearly $800 million at the box office. If you’re in the group of happy camper filmgoers rather than grumpy old critics, then we at SavingPlaces.org have decided to recommend to you a couple sites related to this box office juggernaut. In Batman v. Superman, Wayne Manor, the house of the Caped Crusader (played by Ben Affleck), has burned down. So, the superhuman crime fighter must find a new place to live and moves into a lakeside Modernist house with transparent glass walls. This architectural violation of privacy, which you can tour on Google Maps, was built specifically for Batman v. Superman. However, Bruce Wayne’s new crib was modeled after two masterpieces of Modernist architecture that also happen to be two National Trust Historic Sites. The Farnsworth House's glass windows were intended to convey a sense of connection with the natural surroundings. 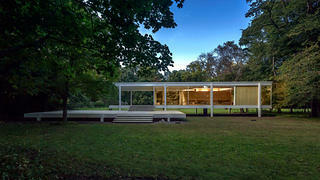 The first is Mies van der Rohe’s Farnsworth House. The German-American van der Rohe is considered to be one of the pioneers of Modernist architecture, and his Farnsworth House near Plano, Illinois (55 miles southwest of the Second City), has become an iconic site of the nation’s architectural landscape—so much so that a Lego model of it was manufactured as part of the Danish toy company’s Architecture series. For more than half a century, the Farnsworth House was a private residence, built for Dr. Edith Farnsworth as a country retreat from the rat race of the big city. The building’s see-through glass walls, held together by steel, and austere furnishings made of natural materials were intended to suggest a sense of connection with the external rural surroundings. Purchased by Landmarks Illinois and the National Trust for Historic Preservation in 2003, it serves as a museum. 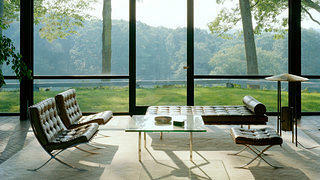 Philip Johnson's Glass House was closely modeled after the Farnsworth House. Both served as models for Bruce Wayne's new house. A second strong influence on Bruce Wayne’s new not-so-humble abode is the Philip Johnson Glass House in New Canaan, Connecticut. This house—a rectangular building with four glass walls and a steel roof—was designed by postmodern architect Philip Johnson as a home for himself. As in the case of the Farnsworth House, the Glass House’s transparent glass walls and minimalist, natural design allow it to blend in with the surroundings seamlessly. Featuring an extensive collection of 20th-century art, it has served as a museum since Johnson’s death. Tours are organized from May to November. Although Batman v. Superman is pretty standard popcorn fare that’s made sophisticated critics frown and groan, the architectural influences on Bruce Wayne’s new house are very high-brow. If you devote considerable time to dusting and polishing your treasured collection of Batman action figures or some other DC Comics-related hobby, consider paying a visit to either the Philip Johnson Glass House or the Farnsworth House. Being able to not only explain the real-life buildings that inspired Batman’s new house but also claim to have been there will certainly make you a hit at the next Comic Con. Mies constructed this glass box residence of “almost nothing” for Dr. Edith Farnsworth as a country retreat along the Fox River in Plano, Illinois. Today it is owned and managed by the National Trust, and the site is open as a public museum. The Glass House is one of the nation’s greatest modern architectural landmarks. The pastoral 49-acre landscape comprises fourteen structures and features a permanent collection of renowned 20th century painting and sculpture, along with temporary exhibitions. Filip Mazurczak is an editorial intern at the National Trust for Historic Preservation. He previously worked as a freelance journalist, translator, and editor. He is from Sioux Falls, South Dakota.